B. Transmission box made in China with optimized design, has medium torque, strong bearing capacity and so on. C. Wear resistant, high precision screw element and barrel, used to ensure the stability of quality. D. The unit can be carefully optimized according to the user's requirements, and all components are configured according to the high precision machining standard. B. German HENSCHEL transmission box to be installed, so that the extruder can be used under a high torque, high screw speed, and high production efficiency working condition, with lower noise. C. British BIBBY safety coupling to be used, once the material is blocked, the torque suddenly rises, a transmission box and a screw can be quickly separated. D. Adopt high wear-resistant, high-precision screw elements, and the segment barrels with high wear resistance oval liners to ensure the stability and continuity of production. E. The unit can be carefully optimized according to the user's requirements, and all components are configured according to the high precision machining standard. A. KP Twin-stage unit is suitable for modification and mixing for heat sensitive materials, high filling masterbatch, engineering plastics recovery and so on. B. The unit is composed of S series or H series twin-screw extruder combined with single screw extruder, can achieve high yield extrusion. In order to have a place in the field of parallel twin-screw extruder manufacturing in China, it is indispensable to be based on innovation. 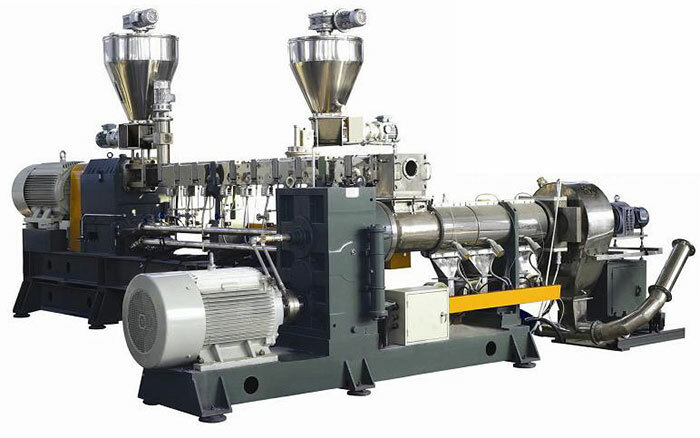 As a manufacturer of parallel twin-screw extruder, Shanghai Omega extruders are positioned on the basis of high technical content, high extrusion efficiency, low machine energy consumption and high cost performance. 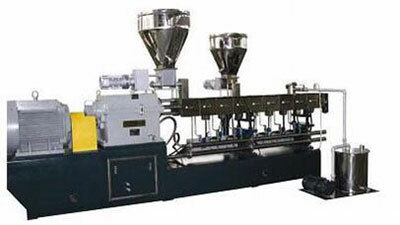 Our goal is to produce all the parallel twin-screw extruders of various Omega brand, the main qualification is higher than the one of domestic manufacturers, so as to ensure that our extruders can meet the needs of users at all levels of the market, even the demanding requirements of those advanced terminal markets. 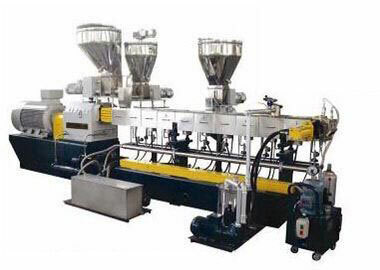 Therefore, the parallel twin-screw extruder produced by our company is based on the overall performance and configuration of the extruder, can be positioned to meet the needs of all levels of the market, and is positioned in the high-end market at home and abroad. Our screw shaft made of special materials can guarantee the extruder screw speed up to 900rpm and over, under high output requirements. The screw torque ratio value can compete with the German W&P high-end ZSK model, and is equivalent to 8.7Nm/cm3 of KraussMaffei's ZE model. In order to meet these requirements, in addition to the traditional three-axis drive mode for the transmission box of our parallel twin-screw extruder, can be chosen, but also we can provide the "Double-side gear symmetrical drive mode" (See right) which is most advanced in the world. In order to pursue the high reliability and long service life of the gearbox, we use the SKF bearings made in Sweden and INA bearings made in Germany for all our gearboxes. Regard to the barrel of the extruder plasticizing system, all kinds of Omega brand twin extruders are equipped with standard configuration of high-chromium iron Ω101A oval liners which is the same as code 043 of Werner & Pfleiderer (GMBH) company. And for high glass fiber filling working condition, we can also be equipped with high vanadium cast iron Ω102A oval liner which is the same as code 99.3 of German W&P company. This Ω102A oval liner we have recently developed successfully, the service life of which is more than one time of Ω101A. Of course, we can also provide users with nickel-based with high-chromium alloy Ω301A oval liner for the specific corrosion working condition of user's extruder. The thread curve of conveying element and the meshing surface of the kneading disk are designed according to the principle of equal gap meshing, which is designed by computer optimization program to ensure that the two screws always maintain the same minimum meshing clearance during high-speed co-rotation. For example, the unilateral clearance between the screw element and the inner wall of the barrel of the SHJ-H-27/48 model which our company recently exported to the US market, reached 0.15mm, which is equivalent to the kneading gap of the German W&P model. In most domestic manufacturers, in order to avoid mutual interference of the screw during operation, the gap value of the same model is greater than 0.30mm. Our company's screws meshing gap is smaller, the material mixing effect is better, the granulation product has higher density, and the physical properties of the material are more ideal. The user has feedback to us that the materials to be processed are very versatile. They use the same screw combination but can be applied to a variety of materials with different properties. 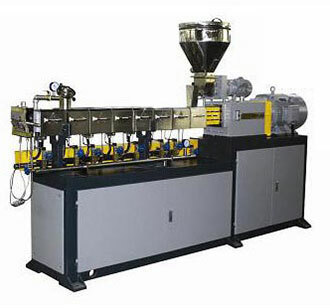 For the extruder control system, our company has specially developed the HPCS-2000 type control software for the parallel twin-screw extruder, which is convenient for the users to realize the more intuitive process of the extruder from formulation, metering, feeding to forming and other more extrusion steps. It is simpler and allows remote operation for controlling the extruder. In order to pursue the high stability and high reliability of the extruder, our main motor DC governor adopts British Eurotherm governor or Siemens governor. The main motor AC variable frequency speed regulation adopts Japanese Mitsubishi or Fuji Ac frequency converter. The inverter is controlled by Siemens PLC. For the temperature control, we use the Japanese RKC brand temperature control instrument, because of its two-way PID setting, artificial intelligence adjustment, high precision and so on, the temperature control of the extruder is more accurate. In addition, our control system also provides protection functions such as current overload protection, charging motor and main motor interlock, oil pump motor and main motor interlock, head pressure alarm, barrel temperature alarm, torque limit interlock, etc. to ensure reliably run under a long-term operation period for machine.